In this day and age, if you're a kid and off school sick, you've got it made. There's Netflix, YouTube, illegal torrents and a million games available for your tablet. Of course, back in the mid 80s, you were lucky if you're family even had a VHS player. The internet did exist, but mainly in the form of newsgroups and with limited access. Games, well, again they did exist, but they took a good 20 minutes to load before you broke your wrist waggling a joystick. Luckily, descending upon this mundane world was the wooly jumpered messiah, Richard Stilgoe. His aim, to prove that when you're feeling pale and wan, life Stilgoe's On. Stilgoe's On episodes sought to show kids how to keep themselves entertained indoors. To this end, renowned songwriter, raconteur and general wit, Richard Stilgoe created a wonderland packed full of scissors, glue and crayons. School children, dressed in Stilgoe's On jumpers, arrived and messed about like it was a Friday afternoon 'fun hour'. Stilgoe delights in guiding them through various activities and, when possible, jumps on the old Yamaha DX7 keyboard to bang out a ditty. Each episode had a theme such as magic, words and how to have a party. Guests also featured throughout the series and included Fred Harris, Ray Alan with Lord Charles and Paul Jackson the Origami Man. that you're making your will. but remember life still goes on. Eight episodes of Stilgoe's On were produced, but sadly none have made their way to YouTube. Doing our bit for retro televisual preservation, we attended the BFI Archive to watch the very first episode. Stilgoe is best known for his songwriting ability and the theme tune to Stilgoe's On is an utter treat. Featuring the harmonies of multi-tracked Richard Stilgoe's, it's a melodic and catchy beast that's difficult to rid your inner ear of. Even now, weeks later, we remember it better than our own mother's face. A nice link here is that our mother and father once went to some type of 'An Evening with Richard Stilgoe'. As we mentioned in our intro, the mid 80s were lacking in interactive activities for children. We certainly remember the frustration of pulling out colouring pencils and drawing yet another 'supercar' complete with boosters. The activities that Stilgoe presents aren't the most startling pieces of entertainment. We enjoyed the 'codewheel' activity as all kids dream of being a spy, but other activities were less fun. We're not sure that a psychiatrist would ever prescribe "acting in the manner of a word" to someone feeling "woe begone". Stilgoe, himself, is a curious host to the show. He never patronises the children, which is to be applauded, but he doesn't particularly sell himself as an avuncular figure either. His persona in Stilgoe's On is more of a supply teacher - packed full of quizzes and games, but not someone you'll miss once your normal teacher's back. Nonetheless, he puts on a good enough show and treats everyone to a song, so you can't say you're shortchanged. Our favourite part, of the show we saw, was when Ray Alan and Lord Charles popped up. It leads to a few laughs and gets the kids, Richard and Ray Alan all interacting. It felt like a nice treat at the end of school term. Indeed, one episode featured a magician 'The Great Soprendo', which again would have delighted children. Quite how entertaining Paul Jackson the Origami Man was, however, will remain a mystery. We're not 100% sure that Stilgoe's On is a great success, but we're rather fond of it. It's an admirable approach to entertaining kids in an era of huge boredom. The activities featured are rather hit and miss, but at least the performance section at the end grabs your attention. Stilgoe's On struggles to integrate Stilgoe's trademark wit, but, overall, it's an interesting look back at the mundanity of life for a mid 80s child. A once popular form of entertainment for children was the 'choose your own adventure' book format. The reader would start reading a page and, at the end of it, they would be given a number of options of how to proceed. Each option result in turning to a different page to continue e.g. Truth be told, they weren't much cop and, occasionally, you turned to the wrong page leading to much confusion. There were a series of Knightmare books which were rather entertaining, but they were in the minority and relied on an established gimmick. The problem was that, more often than not, you had much better ideas of where to take the adventure - the majority of them being written by wispy bearded men from Saffron Walden (you know the types). What the world was calling for was an interactive TV show which would ask: What's Your Story? Stephen is busy being a late 80s teenager when he receives a phone call from his cousin Laura (Lisa Rose). Her father, Miles, who lives in sleepy Cornwall has disappeared. Sounds like a right old mystery, so Stephen and Laura hop on the train and head for the West Country with their deerstalkers on. Miles' cottage is in a right two and eight and appears to have had a whirling dervish rummaging through all of Miles' belongings. Stephen and Laura, being particularly tidy and well organised folk, decide to start tidying things up rather than getting on the blower to the old bill. THE INTERACTIVE BIT COMES IN! Yes, you, the viewer can/could then ring up and determine how the storyline unfolds. And who narrates the whole affair? 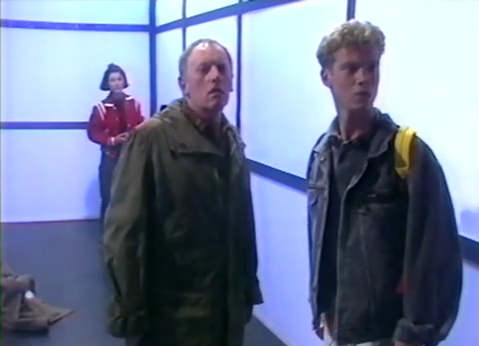 Oh it's the current Doctor Who - no not Peter Capaldi (It's 1988, remember?) - Sylvester McCoy! What's Your Story first aired in 1988 as a series of daily episodes between Monday to Friday over two weeks. A second series followed in 1990, but was reduced to just one week. Episodes were recorded in Studio A at Pebble Mill, Birmingham and directed by Richard Simkins. Piecing all the submitted ideas together was writer Peter Corey. Being a daily, live show, it's inevitable that production was rather manic. Sylvester remarked, at the time, that Peter Corey had to work frantically through the night to produce a new script for the morning. New sets then had to be built, lines learnt and the whole thing recorded by 4pm. Sylvester later recalled a hectic atmosphere in the studio and remembered part of the set catching fire whilst he was addressing the camera. 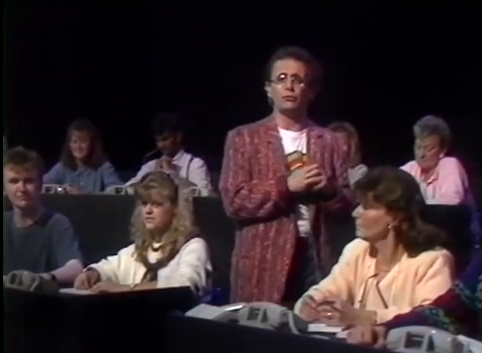 The 'phone in' feature of the show was highly successful with 500,000 calls in the first week. The volume of calls was so great that, at one point, BT couldn't cope and the line collapsed. The second week of the first series changed the format slightly, in that four ideas were chosen from the viewers and then these were voted on by the public. Being 6 years old and crazy about Doctor Who, it's no surprise that we eagerly watched What's Your Story way back when. Our vast memory banks don't appear to have dedicated much time to consolidating memories about the show, but some traces still linger. Firstly, we remember being rather excited that we could shape the story. Unfortunately, we were barely capable of using a phone at that age, so we never rang in. 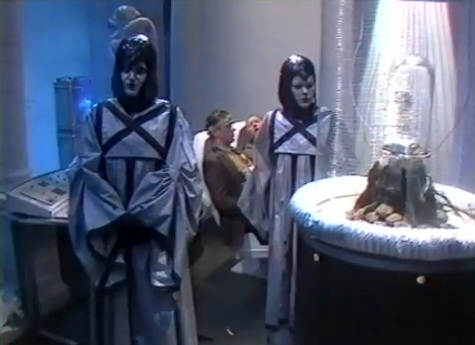 Secondly, we remember Sylvester getting rather annoyed by the number of Doctor Who related storylines being submitted. It was time to investigate and, luckily, YouTube yielded several long sections of the show. There's a mysterious, sci-fi feel to the show which brought back some strong memories. It's difficult to avoid Dr Who comparisons, but it calls to mind a similar atmosphere to McCoy's tenure as the Doctor. It's slightly less adult given the timeslot, but little things like the incidental music bare an uncanny resemblance. The plot mixes in elements of danger, adventure and suspense which make for a rather chilling and terrifying tale at times. It's certainly a very different beast to Byker Grove and Grange Hill. Even if you ignore the phone in gimmick, What's Your Story feels like an innovative show for children. The BBC weren't exactly treating Doctor Who in the schedules very well, so it's nice to see that, at least, they were investing some faith in Sylvester McCoy. He's an eccentric fellow with a clownish nature, so kids are always going to love him. The established actors give decent performances which chime with the times, but Lisa Rose is all stiff and wooden, much like a pair of stilts, if you will. The sets are rather disappointing, but we'll forgive the crew due to them working against a very limited timeframe. One thing that particularly irked with the show is how they break back to the studio for Sylvester to tell us exactly what we've just watched. It gives a jarring feel and highlights that the amount of material they could record was lacking. We can't give a full, in-depth comment on the series as less than 30 minutes are up on YouTube and nothing of the second series is available. From what we've seen - and vaguely remember - it's an exciting children's show which was rather unique in utilising the viewer's imagination. We suspect that Peter Corey had a framework for the story in place and merely used suggestions that fitted this, but it doesn't detract from its appeal. We'd like to view more and will certainly be hunting down more information on the show. Everyone can get a bit gibberish at times. Speaking to a beautiful girl, attempting to argue when we know we're wrong and awkward urinal chats are some of our horror scenarios. There is, however, a certain schadenfreude when it comes to watching others trip over their tongues. The resulting superiority boost always results in a hearty laugh. Accordingly, chuck a few comedians into the mix and the laughs should rain down heavily; that's what the producers of Gibberish were banking on. 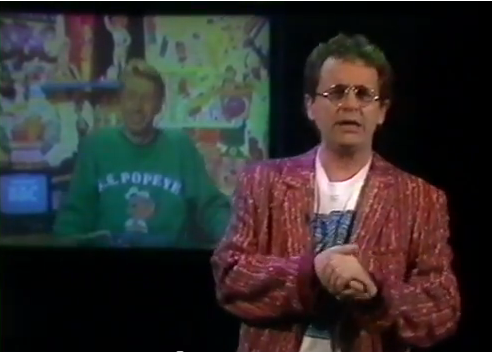 Gibberish was a 1992 comedy panel show hosted by Kenny Everett. Part improvisation, part wordplay, the show featured two teams of three: Jessica Martin, Barry Cryer and Danny Baker versus Carol Vorderman, Steve Punt and Jan Ravens. The teams remained the same throughout the series. Opening Letter - Team members are given a letter each and have to form a sentence using those words e.g. letters O, P and S are given out which result in "old people sympathise". The team have to keep it going for 30 seconds. Newsreader - A team member is nominated to 'tell the news' based on words prompted by Kenny. Reveal Your Identity - One team member has to ring the other and give them clues as to who they are. The series aired from Monday to Friday in the mid morning slot on BBC1. Only one series was produced and it was never repeated. It was the final show hosted by Kenny Everett who passed away in 1995 from an AIDS-related illness. We were first made aware of Gibberish during a lively Twitter chat about forgotten TV shows. It wasn't a show we remembered from its original run, but it certainly aired during a period where we could have caught an episode. The fact that it was one of Kenny Everett's final television appearences also intrigued us. Some of our earliest telly memories are from The Kenny Everett Television Show, so we decided to investigate. Very little information was found online, not surprising for a show tucked away in the daytime schedule. There was certainly no footage available, just one group photo of the teams. The BFI Archive holds every single episode, so we booked in to watch the first episode. The morning slot lends itself to a casual feel to proceedings, much like Win, Lose or Draw which Danny Baker was also involved with. Kenny dishes the points out as he wants, sometimes regardless of the team members actual performance. There are no desks which add to the informal feel and Danny Baker is frequently shouting at the opposing team in his inimitable style. Kenny isn't in full on MANIC mode, but he slips into it every now and then whilst keeping the show moving. Gibberish isn't as anarchic as They Think It's All Over or Never Mind the Buzzcocks, but we doubt anything in this timeslot could be. Atmosphere wise, then, it's perfect for the intended audience of stay at home mums and students. A rum bunch indeed. The guests are decent fare although we have to confess to having no idea who Jan Ravens and Jessica Martin were. After doing a little research, we were able to pinpoint Jan Ravens, but Jessica Martin's CV rang no bells to us. Carol Vorderman had been part of Countdown for 10 years when Gibberish aired, so she was somewhat of a quiz show veteran. She displays her usual slaphappy charm and delivers some good laughs. Steve Punt provides the Oxbridge smarts and Danny Baker roars in with his playful, everyman persona. Presiding over them is Barry Cryer, a legend of British comedy who has worked with an endless list of stars. He seems to be the most at home here, which isn't a surprise as he'd been appearing on I'm Sorry I Haven't a Clue for the previous 20 years. Some of the games work better that others and, as a whole, Gibberish isn't as funny as Whose Line is it Anyway, perhaps it's nearest relative. We weren't particularly impressed with the set either. Rather unimaginative, but then wasn't everything pre-Who Wants to be a Millionaire? Actually, no, there was a curious charm to the Fifteen to One set. It's a minor quibble, but quibble we shall! Gibberish is a harmless piece of fluff which provides some good laughs and is something we would have watched at the time. Kenny Everett had been diagnosed as HIV positive a few years earlier, so we suspect that health issues perhaps led to Gibberish being a one series wonder.